Riding a motorcycle is a hell of a lot of fun, it can also be pretty dangerous. We are all aware of the generally sloppy, half awake, lemming, baby brained and damn right stupid drivers that habit the roads. 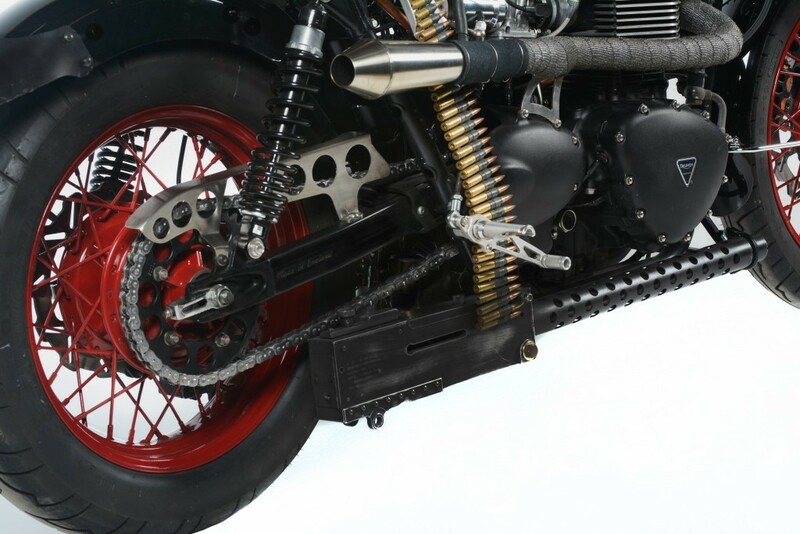 Well the chaps at Putsch Racing have come up with a motorcycle and a Triumph at, which may… sorry will make other road users respect you as a motorcyclist and pretty much avoid you at all costs. 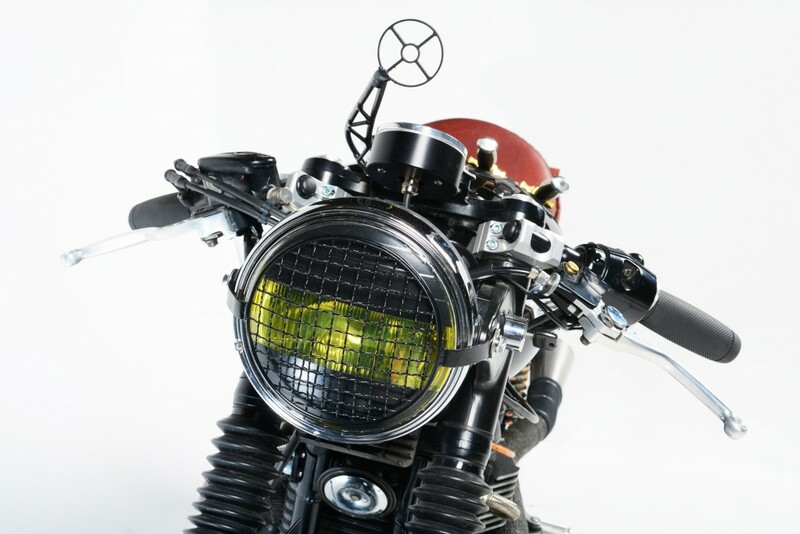 Based in Dublin, Ohio, Putsch Racing have built the ultimate Steampunk motorcycle. With this baby you can patrol the roads and motorways near you jut like Manfred von Richthofen aka the Red Baron. Fitted with Browning .30 caliber machine guns and sights from a WWI Sopwith Pup, the rider of this Triumph will be the King or perhaps that should be the ‘Baron’ of the road. Other road users will be looking into the sun with squinted eyes, much like pilots of old, praying that the enemy is not bearing down on them with Brownings blazing. Though one slight turn of the forks the rider may just shoot out his own front wheel…messy and perhaps a little embarrassing. The machine guns are operational, though they only fire blanks. The concussion and muzzle flash is just as it would be as if they were firing live rounds, but the guns are really utilising an on-board system of compressed oxygen and propane controlled by computer through electronic solenoids and ignited in a combustion chamber. Like the planes of the past the rider/pilot of the Aristo-cad, will need to check his speed, on this occasion using a classically styled chronometric tachometer by the german company Motogadget. 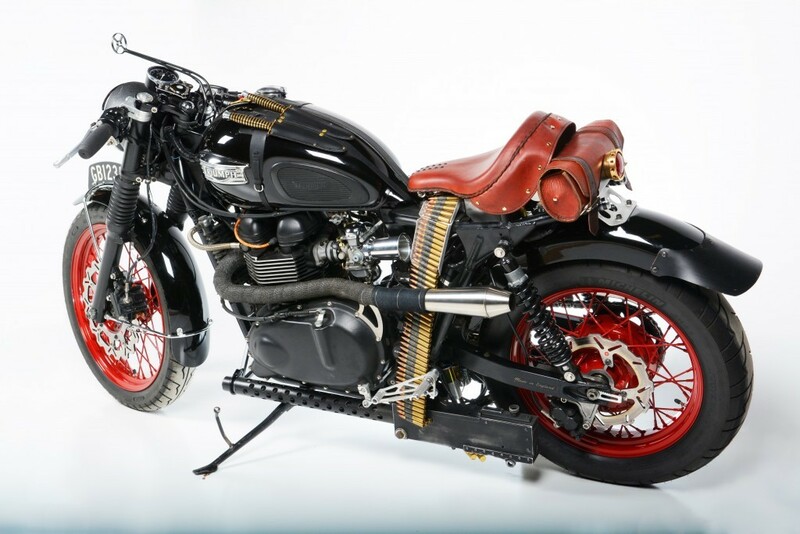 He may also need to keep an eye on time and what would be more fitting than a Tiffany, Porcelain Faced Hunter Cased pocket watch which hides under a protective cover with viewing window, which has then been fitted to the Triumph top yoke. As any Ace knows their may be the odd occasion when the Brownings are no longer a practical deterrent. 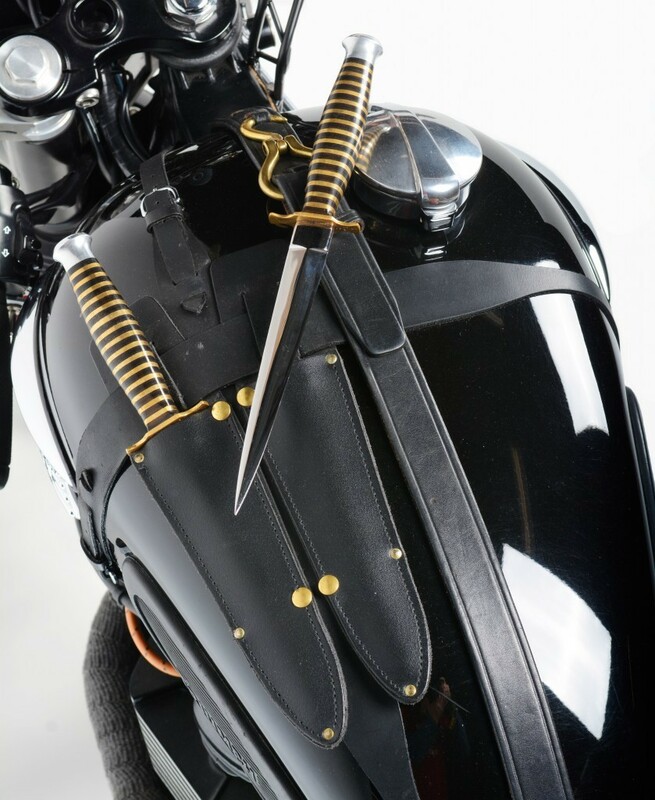 To help the rider cope with these situation, such as stopping for a pee or petrol, the bike has been fitted with a pair of brass handled Fairbairn-Sykes styled Commando knives, which are held in place by brass riveted black leather sheaths and mounted to the tank with straps. Other details on the The Aristo-cad are numerous and range from the English number plate to the machine turned mechanical oil pressure gauge and the hand-aged leather of the seat and tool bag. These have been aged with a combination of jet turbine oil and trade secrete blends. 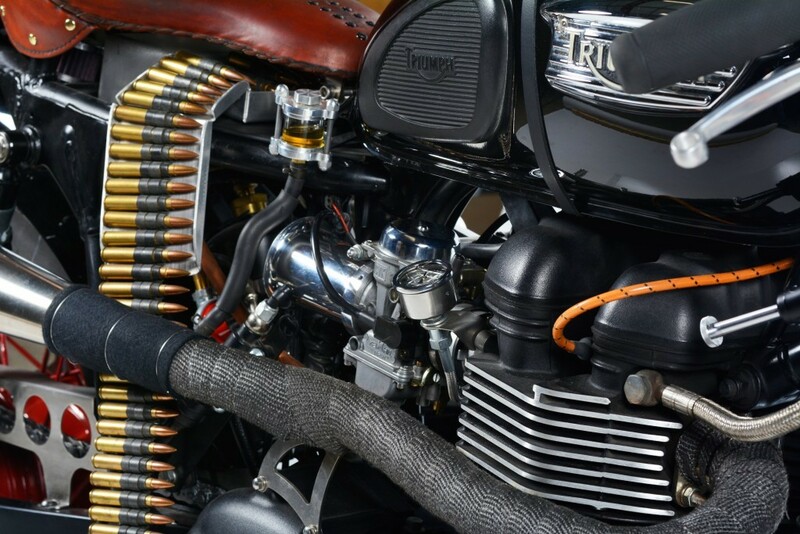 This Triumph engine retains it’s street drivability, but has been tuned with its high pipes and brass screen protected airflow though the polished aluminum intake trumpets. We don’t see many utterly bonkers builds on Bonnefication, especially one which has been fitted with such a mix of British and German weaponry from both World Wars. 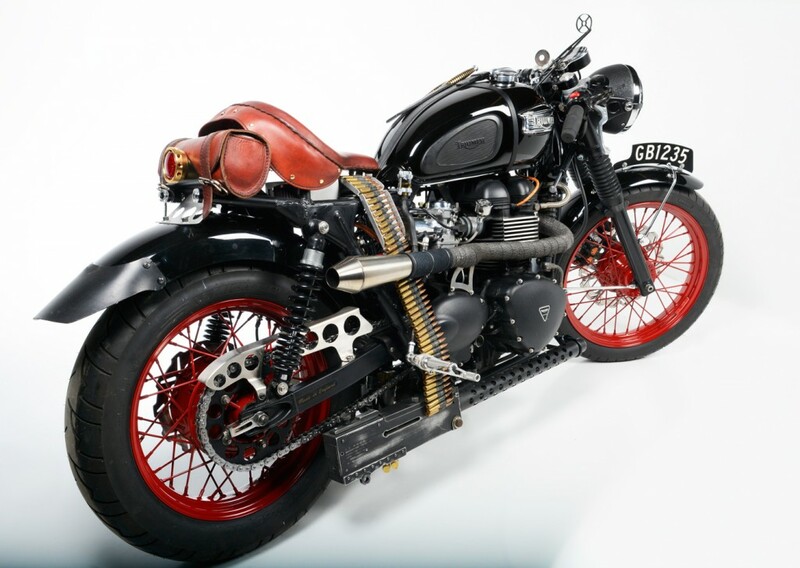 This Triumph looks like it could belong to a fictional steampunk time traveling biker who is taking revenge for the loss of his fellow riders….We Love It!